The Seattle-based non-profit organization Sawhorse Revolution is currently raising funds to sponsor the building of a "moveable eco-village" to house the city's homeless. They are calling the project the Impossible City, and with the help of volunteers from among the local high school students and building professionals they home to start building it soon. Currently they are trying to raise the funds via an Indiegogo crowdfunding campaign. Once built, Impossible City will house anywhere from 40 to 100 homeless people at a time, with the aim of helping them get back on their feet. This city will also move every 3 to 12 months so the shelters need to be mostly off-grid. 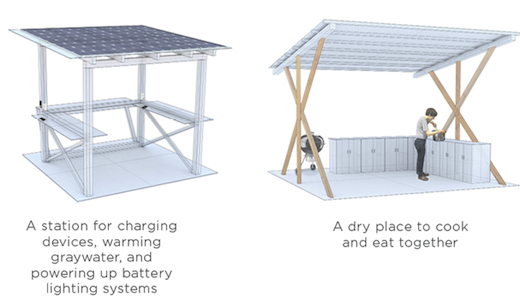 Sawhorse Revolution has already built a few portable, small shelters using recycled materials. 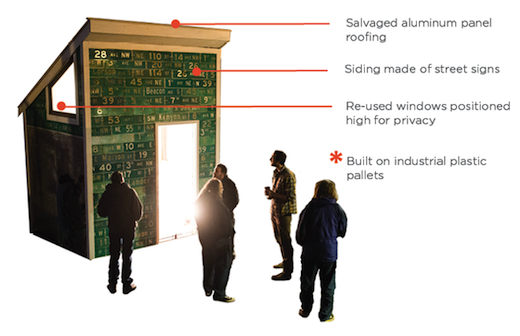 These include salvaged aluminum panels for the roof, disused street signs for the façade, reused windows, and a "slab" made of industrial plastic pallets. 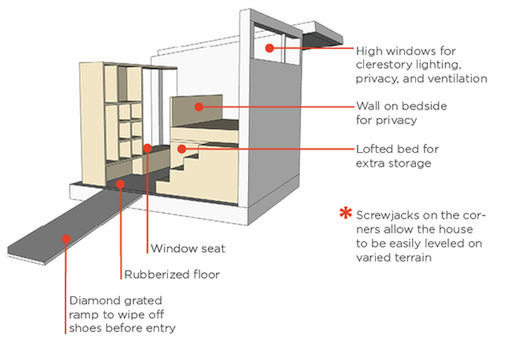 They hope to build six more housing units using tensile or folding materials, since the homes are designed to be collapsible and easy to move. One of their goals is to also add a solar-powered charging station, a community cooking space and latrines equipped with composting toilets. The shelters are to be designed and built by local high school students, who will be working under the supervision of architects, engineers and builders. This will give the teens real world skills and community service experience, which is also the main goal of the Sawhorse Revolution organization. The campaign is just shy of reaching it's funding goal with about 2 weeks left.